Sri Lankan swimmer and FINA Scholarship holder K. T. Cherantha de Silva set two new Sri Lankan National Records in the 50 meter Butterfly and 100 meter Butterfly events with a time of 25.07 seconds and 54.99 seconds respectively at the 59th MILO/PRAM Malaysia Open Swimming Championship 2016 which was held in Kuala Lumpur, Malaysia from May 6 to 8. Cherantha won the silver medal in the 50m butterfly event while Indonesia and Hong Kong bagged the first and third places respectively. The 100m butterfly event saw Cherantha finishing fourth. Indonesia clinched the first and third places leaving the second place to Hong Kong. 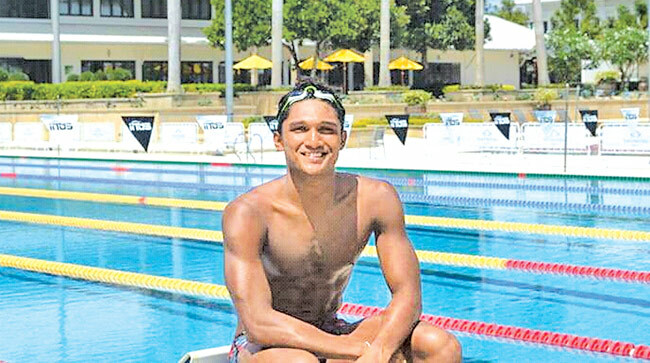 Cherantha erased a 16-year-old SL record in the 50-metre Butterfly event which was set up by Ghefari Dulapandan in 2000 with a time of 25.23 seconds. The former 100-meter Butterfly SL record (55.42 secs) was held by famous Matthew Abeysinghe. Cherantha, an Anadian and a member of Sri Lanka's three-time Olympian Julian Bolling's Rainbow Aquatics is presently undergoing a one-year scholarship programme in Taniapura, Rhuket, Thailand which he received from the international governing body of swimming, FINA in 2015. The scholarship programme is a comprehensive training with the main focus on the Rio Olympics. Cherantha has won seven medals in previous SAF Games in Guwahati, India including one relay gold (4x100m freestyle), two relay silvers (4x100m medley, 4x200m freestyle), two individual silvers (200m butterfly, 100m freestyle) and two individual bronze medals (100m butterfly, 50m butterfly). Since his training in Thailand, Cherantha has shown great improvement and performs only a few microseconds behind to Olympic 'B' grade qualifying mark in the 100m butterfly stroke event. He will participate in his next meet, the Japan Open National Swimming Championship from May 20 to 22 and hopes to better his performance.